Payment Card Industry Data Security Standards or PCI-DSS sets the worldwide information security standards for credit card transactions to help control and minimize points of risk to fraud or compromise of sensitive information. PCI Compliance is an adherence to these rigorous standards in the way your business conducts and handles the information. DataBank provides the facility and critical infrastructure which complies to a RoC (Report on Compliance), that is issued annually to our facilities. The RoC ensures we meet or exceed all of the audit controls. For this reason, many companies and merchants turn to DataBank to conduct their credit card business within our secure facilities. In that capacity, DataBank has specific responsibilities that must be PCI Compliant. 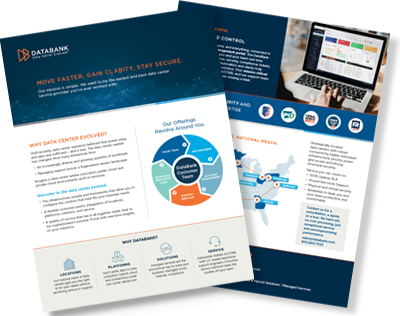 As a provider of data center and managed services to some of the largest publicly traded companies in the world, DataBank is committed to performing PCI-DSS audits on an annual basis.